A gemstone Pick can generate most unique resonant effect on guitar strings due to a special coupling of stiffness and mass density that results in an ideal acoustic impedance, makes it quite distinguishable to picks that are made of steels or plastic. On the other hand, jade material has similar density as that of a regular glass but its stiffness is somewhat 30% lower (elastic mouduli for steel: 200, copper: 100-125, glass: 70, and jade: 50GPa), so that a jade slide can provide warmer sound and it is more comfortable, and some people believe that it is healthier, to wear jade slides. Stone Picks Co. carefully selects the best quality gemstone materials and makes fine products out of them. Gemcutting, polishing and edge-tapering are mostly manual so that the manufacturing process is extremely time-consuming and requires great deal of experience and very high enthusiasm. 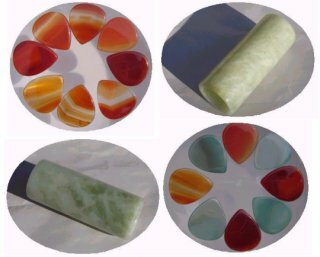 Please note that EACH piece, since made of natural gemstone, has its UNIQUE pattern in terms of variety of color profile and degree of transparency, from piece to piece, point to point. The products shown in the photos of this website are samples and will be similar to but may not be exactly what you are going to get. In case you purchased any products from us but didn't feel like them, you could return the packet to us within 30 calendar days (counting starts from the date of the commodity's delivery to your address) and we will refund your money in full (sorry, we can't refund shipping/handling expenses). Thanks for your business and interest in our products! © Copyright stonepicks.com. All rights reserved. All logos, names, and trademarks are properties of their respective companies.